The growth of Co/Y1Ba2Cu3O7-δ (YBCO) heterostructure with junction areas of 50x70 μm2 and 1 μm diameter is reported. 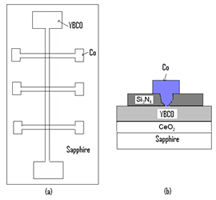 The YBCO films have been grown by pulsed laser deposition on sapphire substrates with CeO2 buffer layer. Temperature dependent resistance measurements have been carried out across the Co/YBCO junctions with two different dimensions in order to investigate Andreev Reflection (AR) phenomena. The resistance variations across the two kinds of junctions are studied and compared. It is noticed that some features of AR are present in sub-gap region at a larger area junction, which are superimposed by multiple peaks. In contrast, signature of AR is clearly visible for smaller area junction. Modeling of the resistance data according to the modified Blonder-Tinkham-Klapwijk (BTK) theory yields a spin polarization (P) in Co film amounting to 34%.